In this issue, we are glad to bring you a new series of One Pagers focusing on non-contributory social protection programmes in countries of the Middle East and North Africa (MENA) region. We also present a new study focusing on Brazil’s experience in the integration of administrative records for social protection policies. Finally, we share the latest news and updates regarding the Centre’s activities. In the Working Paper "The role of zakat in the provision of social protection: a comparison between Jordan, Palestine and Sudan", Anna Carolina Machado, Charlotte Bilo and Imane Helmy (IPC-IG), explain the relationship between zakat, one of the five pillars of Islam which can be considered a religious duty for wealthy people to help those in need through financial or in-kind contributions, and social welfare. 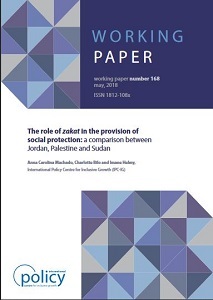 The authors also analyse how Zakat Funds relate to the broader social protection system in these countries. This publication is available in English, and an accompanying One Pager, by Anna Carolina and Charlotte Bilo, is available in Arabic, English and Portuguese. 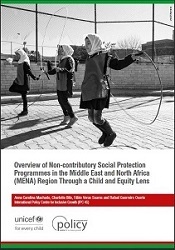 Following up on last month’s launch of the report "Overview of non-contributory social protection programmes in the Middle East and North Africa (MENA) region though a child and equity lens", prepared by Anna Carolina Machado, Charlotte Bilo, Fabio Veras Soares and Rafael Osorio (IPC-IG), we are pleased to present the Executive Summary of the study, which is available for download as a .PDF in English, as well as in smartphone/tablet-friendly formats. We are also glad to bring you the first three One Pagers of a series featuring each of the 20 countries mapped in the original study: “Non-contributory social protection through a child and equity lens in Algeria”, available in Arabic, English, French and Portuguese; “Non-contributory social protection through a child and equity lens in Bahrain” (Arabic, English, French and Portuguese), and “Non-contributory social protection through a child and equity lens in Djibouti” (Arabic, English, French and Portuguese). The Working Paper "Integration of administrative records for social protection policies: contributions from the Brazilian experience", by Letícia Bartholo (Institute for Applied Economic Research—Ipea and IPC-IG), Joana Mostafa (Ipea), and Rafael Guerreiro Osorio (Ipea and IPC-IG), delves into the Brazilian Single Registry (Cadastro Único), the backbone of some 20 social protection programmes, which is frequently cited as a successful example of data integration. The authors present some of the essential aspects for assembling the instruments needed for the integration of social protection policies and highlight existing challenges to the integration of services and social protection benefits. This study is available in English, French, and Spanish. Our colleagues and partners from the socialprotection.org online platform will host two interesting webinars this month. On 24 May, there will be a presentation of the CoP SSC4C Thematic webinar: How does South-South Cooperation contribute to achieving Sustainable Development Goal 6: ensuring the availability of clean water and sanitation for all?. Jointly organised by UNICEF, the IPC-IG and the United Nations Office for South-South Cooperation (UNOSSC), it will be the first thematic webinar in a series of the Community of Practice on South-South Cooperation for Children (CoP-SSC4C), focusing on water, sanitation and hygiene. Click here to complete your free registration. On 31 May, the platform will host the webinar The Power of Local Economy Multipliers: Synergies between Social Protection and Agricultural Interventions in Malawi, organised by International Labour Organization (ILO), FAO, UNICEF and the Government of Malawi. Click here to register. The IPC-IG participated in the International Conference on Social Policy in the Islamic World, held in Tehran, Iran, on 12 and 13 May. The conference gathered scholars from a variety of disciplines to discuss the state and challenges of social policies regarding employment, social assistance and children, and other topics, as well as the role of Islamic teachings in such policies. IPC-IG researchers Anna Carolina Machado and Charlotte Bilo presented findings from the Centre’s recent study on child-sensitive social protection in the MENA region, as well a recent Working Paper on the role of zakat in the provision of social protection in Jordan, Palestine and Sudan. Both were mentioned in the ‘New publications’ section of this newsletter. The IPC-IG is welcoming submissions of Working Papers in the field of impact evaluation of public policies. The studies promoted through this series will answer to a research agenda developed in response to global demand in the field. Our Working Papers are peer-reviewed, high-standard publications that enjoy the broad international outreach capacity of our partner networks. Proposals will be examined by the Centre’s editorial board. Selected authors will receive an individual notification confirming the acceptance of their papers. The final deadline for submission is 30 May 2018. Read more here on how to submit your study. The Centre hosted a new session of its 2018 Seminar Series on 15 May, with the presentation of the study "Wage Inequality in Latin America: understanding the past to prepare for the future” by Dr. Joana Silva, Senior Economist at the World Bank’s Office of the Chief Economist for Latin America and the Caribbean. The 2018 Seminar Series is an opportunity to share knowledge and promote debates around current issues of the global development and distributive agendas. The one-hour seminar sessions are held on once a month, at the IPC-IG office. On 17 and 18 May, the IPC-IG organised its 2018 Retreat. The event was an opportunity for the entire team to discuss ongoing and future projects, and to analyse the Centre’s 2018 Work Plan. The event also gathered colleagues from the Institute for Applied Economic Research (Ipea) who are currently working on joint research projects with the Centre. Read our 2017 Activity Report and learn more about our work. IPC-IG Senior Research Coordinator Fabio Veras and Senior Researcher Alexander Cambraia travelled to Nairobi, Kenya, for an inception mission as part of the UNICEF-supported technical assistance that the Centre is providing to the Government of Kenya, from 5 to 12 May. The objective is to update the 2011 Kenya National Social Protection Policy in light of recent developments in the sector and according to the priorities embodied by Vision 2030 and the Big Four agenda. During the mission, the researchers were hosted by the National Social Protection Secretariat in the Ministry of East Africa Community, Labour and Social Protection (MEACLSP), and had the opportunity to meet with representatives of the State Department for Social Protection, Ministry of Education, Ministry of Agriculture, Ministry of Health, National Disaster Management Authority, the National Hospital Insurance Fund and international organisations, as well as personnel from key development partners such as UNICEF, the World Food Programme (WFP), the Food and Agriculture Organization of the United Nations (FAO), the World Bank and SIDA. 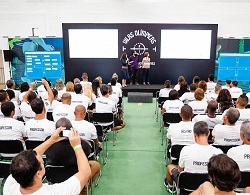 IPC-IG researchers Mariana Hoffmann and Wesley Silva delivered a presentation featuring the results of the baseline study of Nike’s Olympic Villages Project, in the city of Rio de Janeiro, from 24 to 27 April. The meeting gathered hundreds of sports teachers from 22 Olympic Villages located in Rio de Janeiro and representatives from as Nike and from the local government.